Whenever changes are made to your site, whether it be updating your theme, a plugin or WordPress core, it is highly recommended to backup your website. There are two parts to backing up your site: 1) the Database and 2) the Files. For the most part you will only need to back your database up when updating plugins, but it is recommended to do a full backup (database and files) on a regular basis. The best way to backup your database is by using phpMyAdmin from your hosts control panel (cPanel, Plesk, etc). This will enable you to get the entire database. Using the built in WordPress exporter plugin will only back up the core database. If a plugin – like Event Espresso – uses its own database tables they will not be saved using the export function. 2. On the the main menu, either select your database from the list on the left or click the Databases link and select your database from the list that appears. If you have several databases there and you are not sure which one you need to choose, you can find your WordPress database by looking at the wp-config.php file in your WordPress folder or your server root folder. 3. You will now see a long list to the different tables available. This should contain your Event Espresso tables (prefixed by wp_events) and your general WordPress tables. The prefix wp_ is a standard one but some hosts may use something else. 4. On the menu at the top click Export. This will show a couple of options and all your tables should be listed on the left. The options are Quick and Custom. If you know something about databases you can click the Custom and tweak as needed, otherwise leave it as Quick. Below that is a dropdown for your export type, make sure it is on SQL (the default). Then press the “Go” button. A pop-up will appear asking you to save the SQL file to your computer. That’s it, the database is now backed up. Only the posts and comments and settings are backed up, your images and files (themes, plugins) are not backed up by this method. OK, so the reason you backup the database is so if something goes wrong you can revert back to a recently saved version. Here’s how to do that. 1. 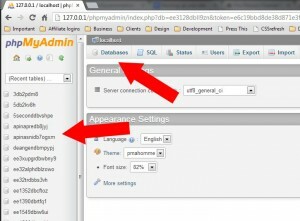 Log back into phpMyAdmin through your webhost’s control panel. 2. Select all the tables in your database, and in the drop down menu (With Selected) at the bottom, select “Drop”, then press “Go” in the bottom right of the screen. This will delete your database! It is necessary in order to restore the previous backup, but if you are concerned, make sure your backup is valid and uncorrupted before doing this. You can also rename the database to something else and create a new blank database with the same name as the original. 3. On the top menu click “Import”. Under the “File” to Import section click the “Choose File” and select the “SQL” file you previously exported and click “OK”. 5. Grab a coffee/tea/beverage of your choice. If you don’t wish to do this manually there are several free and paid for plugins available that can back up your database for you.